This Sun City "Hideaway" is situated on a spacious lot offering a stunning view of the Flat Top Mesa. The .20 acres is fully landscaped and easily maintained. The home is highly upgraded throughout and has had very little use. This popular floor plan has two spacious bedrooms, a large great room, and additional sun room. The Anderson over-sized front storm door allows for plenty of light & gorgeous views of the Virgin Mountains. The kitchen has upgraded granite counter tops, Maple cabinets with pull out shelves and stainless steel appliances. The cook top, refrigerator, cabinet pulls and back splash are a bonus. 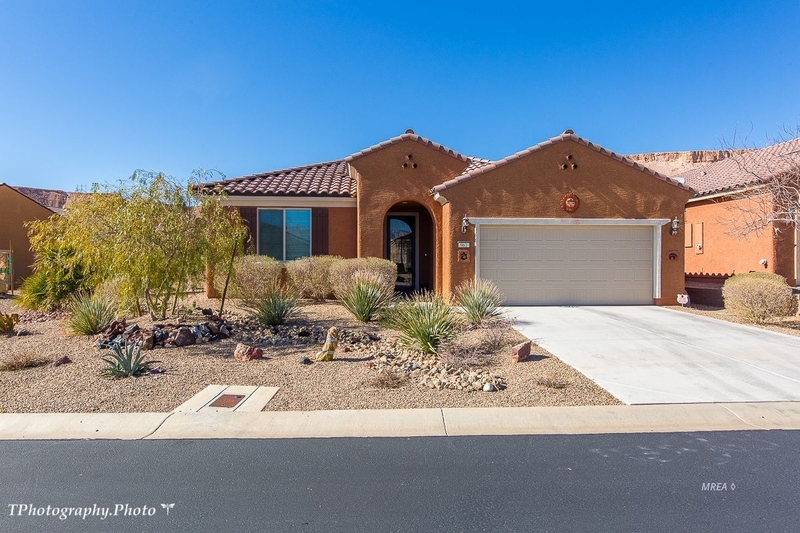 The home has extended tile flooring on the diagonal, upgraded ceiling fans, window coverings, water softener and R/O. 4-inch base boards and upgraded Roman doors are found throughout. The finished garage has a very useful utility sink and has an extended space for extra storage.